On Saturday morning my boyfriend and I woke up early by our weekend standards (thanks be to sunshine) and by 8am we were ready for breakfast. We rolled by Por Que No because we've been wanting to check out their breakfast but it turns out they are on the Portland lazy hazy weekend schedule and open for brunch at 11am. 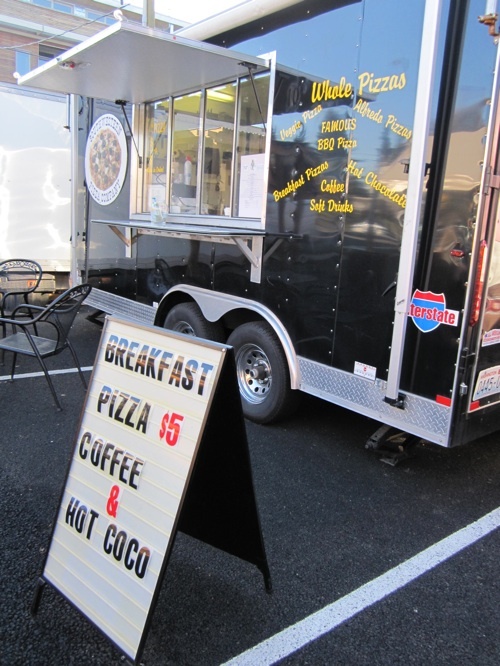 We drove south on Mississippi and decided to check out what Portland's newest food cart pod -- Mississippi Marketplace -- has to offer for breakfast. There were a few options and we went with The Big Egg saddled in between the newest Garden State outpost and a coffee cart. It was is good as it looks. The soft brioche sopped up the sunny yolks, the blue cheese melted into the bacon, and we stopped talking for a while. Yum. You can check out The Good Egg's full menu here. 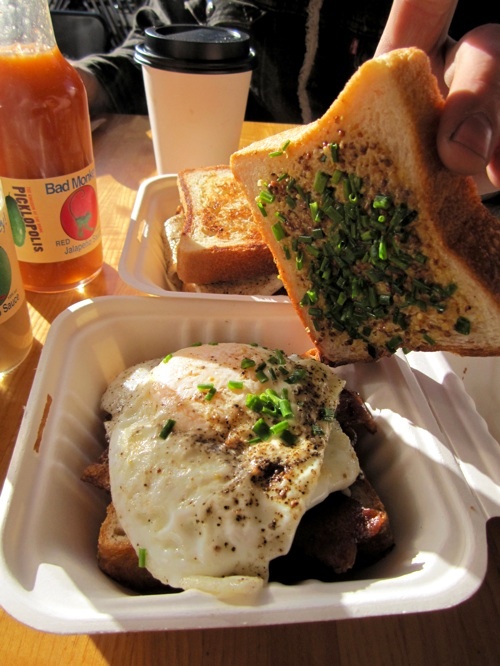 It's nice to be at a food cart pod in the early AM if you love food as much as I do. It's similar to getting early to a big show and watching roadies unload and set up. There just aren't as many bus tubs of alcohol involved with food cart set up. At least not in plain sight. There were several carts prepping for the day and we even got to sample Southwestern Pizza Company's breakfast pizza which was delicious. We sampled his breakfast pizza and it was tasty. No sauce just lots of butter and bacon. Mississippi Marketplacewww.missmarketplace.com SW corner of N Mississippi Ave. and Skidmore St.